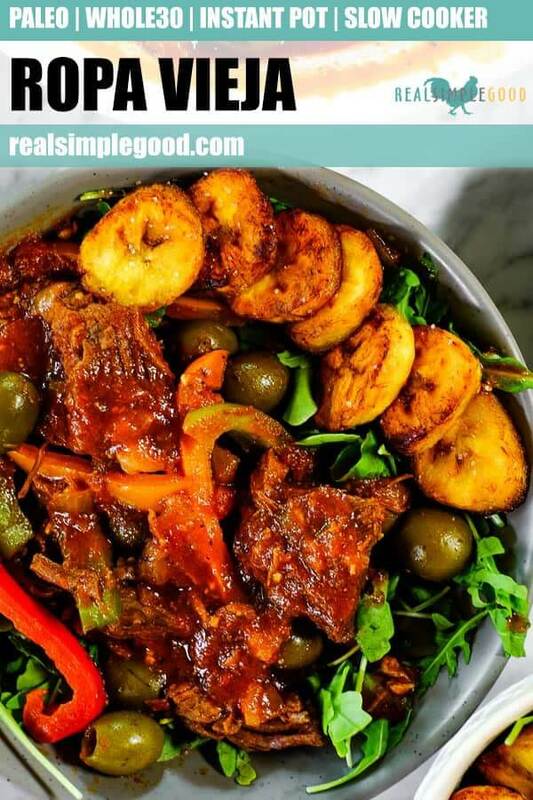 This Paleo + Whole30 ropa vieja has a rich, bold flavor with hints of smoky, savory and sweet. 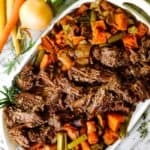 The tender and juicy beef is cooked to perfection in either your instant pot or slow cooker, and we’ve got you covered with instructions for both. 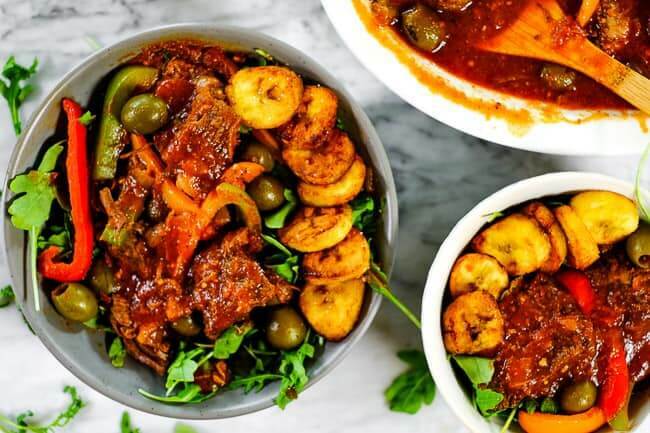 This ropa vieja is our take on the traditional Cuban dish, and it is sure to become a new household favorite! 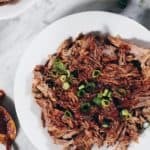 We love making this ropa vieja in our Instant Pot, and one of the best tips we have for making really juicy, tender meat is to use the “sauté” function. Pressure cooking can easily result in a dried out roast when you just throw it in and cook. So, we like to cut up our roast into large cubes (about 2 inch cubes), and then brown it with the “sauté” function before adding the rest of the ingredients and pressure cooking. Then, once the cooking cycle completes we like to let the pressure release naturally for at least 20 minutes to lock in the juices even more. 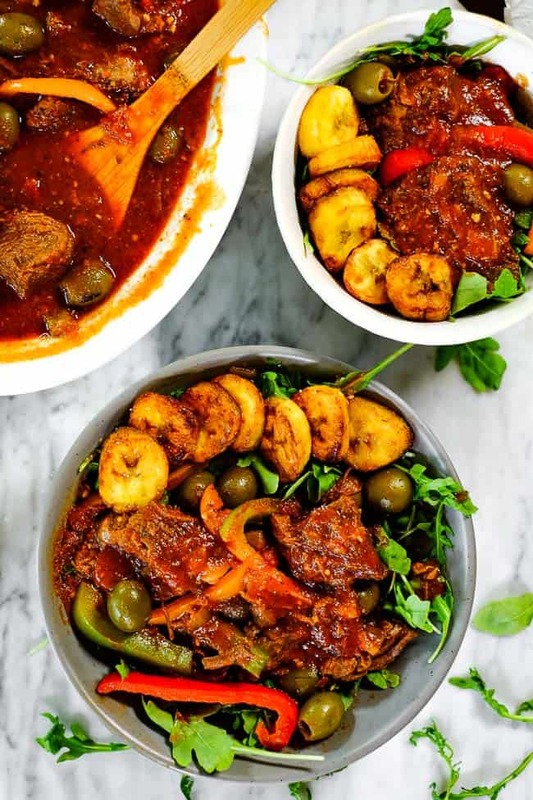 You have a lot of options for serving this ropa vieja. It comes out pretty saucy, almost like a stew, so you can use as much or as little of the sauce as you’d like. 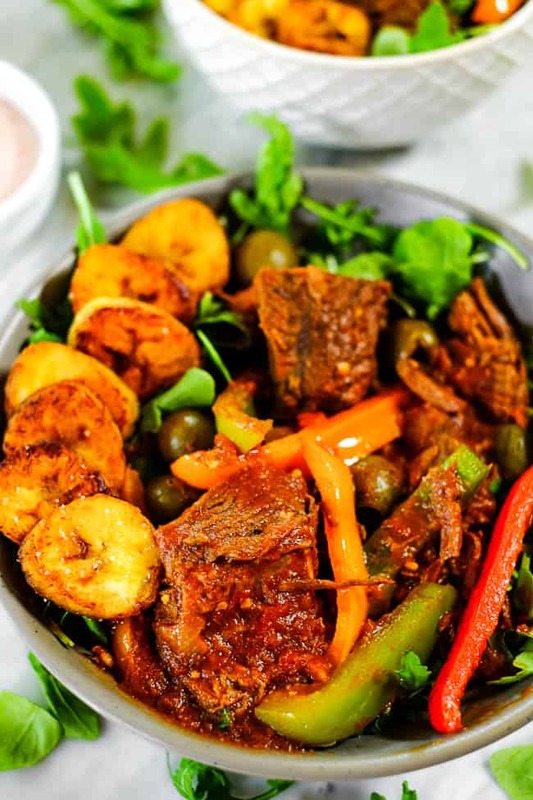 Our favorite way to enjoy it is to serve this ropa vieja over a bed of greens with some fried plantains on the side. It’s really the most satisfying combo! You can also serve it almost like a curry, with greens and white rice or cauliflower rice. 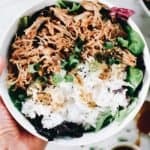 Stick with cauliflower rice if you are doing a Whole30. If you’ve never fried plantains before, don’t be scared. Typically I see or hear the word fried, and I retreat because it sounds like a messy, scary process. But….stick with me here. Frying plantains is WAY EASY, and so worth it! All you do is score and peel your plantain(s). Slice them into rounds about 1/4 – 1/2 inch thick. Add coconut oil to a skillet and heat it up to medium-high heat. 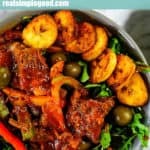 Once hot, add the plantains to the skillet and let them cook for a few minutes until the undersides start to brown, use tongs to flip them over and cook the other side for a few more minutes until browned. Once done, remove the plantains from your skillet and season with sea salt. Done and done! And so damn good! You’ll start frying plantains on the regular once you try! 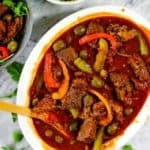 Go ahead and plan this ropa vieja for your next Sunday dinner! 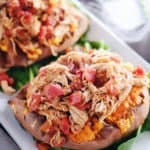 You will love having the leftovers in the fridge the following week for lunches or another easy weeknight dinner. Leave a comment and let us know how it goes. Also, take a pic to share! Tag us on Instagram @realsimplegood, and make sure to give us a follow if you don’t already! We’d love to stay connected! 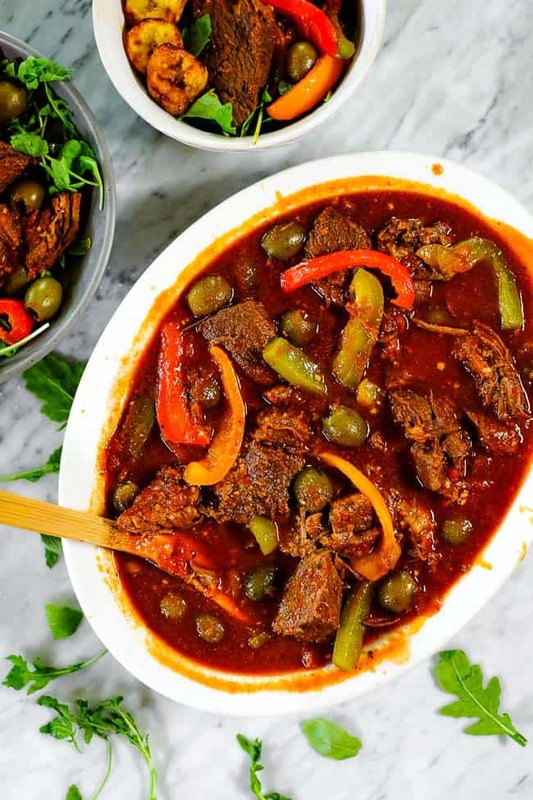 This Paleo + Whole30 ropa vieja has a rich, bold flavor with hints of smoky, savory and sweet. 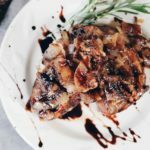 It's our take on the traditional Cuban dish! 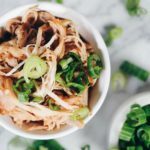 Make it in your Instant Pot or Slow Cooker. Prep onion and garlic as noted. Cut up roast into 2 inch cubes. Press the sauté button on the Instant Pot and add ghee. Once hot, add in the cubed roast and brown on all sides (3-4 minutes per side). Press "cancel" button on Instant Pot once beef is browned. 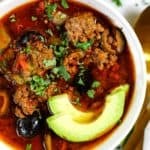 Add in all remaining ingredients to the Instant Pot with the beef (except bell peppers and olives). Secure the lid on the Instant Pot and close the pressure valve. Press "manual" button (or "pressure cook" button) and set the time for 45 minutes at high pressure. Once the time is up, let the pressure naturally release for 20 minutes and then carefully manually release the remaining pressure. Shred the beef using two forks if you desire, or leave the beef in chunks (it should fall apart). Press the sauté button on the Instant pot and add in the bell peppers. Cook for 5-6 minutes, stirring occasionally, until the peppers are tender. Stir in the olives to warm. Serve and enjoy. Omit ghee. 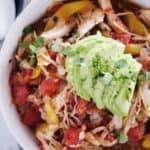 Place all ingredients (except bell peppers and olives) in the slow cooker. Cook on low for 7-8 hours. Shred the beef using two forks. Add in the bell peppers and cook for 1 more hour. Cooking time will vary for a larger roast. We did a 3 pound roast and 45 minutes was perfect. For a 4 pound roast cook for 55 minutes and for a 5 pound roast cook for 65 minutes. yummmmmmmmmmmmmmmmmmmmmmm!! recipe sounds delicious. 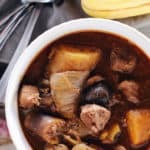 really very nice recipe. Thank you so much. We hope you give it a try!